Winter has nearly arrived and we have started to place our Bird Feeders outside. It’s always so lovely to watch the various birds the feeders attract. I had some leftover willow branches from a previous craft and decided to do this simple bird feeder DIY. For this Birdfeeder DIY you need long, thin willow branches. They should be soaked thoroughly before you work with them. Leave them in water for a few days and try to fold them at 90°. If they don’t break, they are ready to work with. 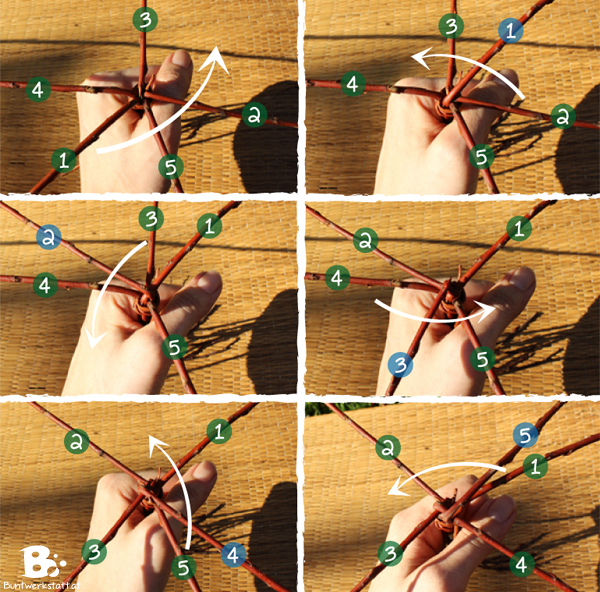 Choose 5 long and thin willow shoots and tie them together on the thinner end of the shoots. 1. Hold the willow in your hands with the short ends facing down. Spread the longer ends out like it is shown in the first picture. 2. Lift up willow 1 and bend it over willow 5 and 2. 3. Lift up willow 2 and bend it over willow 1 and 3. 4. Lift up willow 3 and bend it over willow 2 and 4. 5. Lift up willow 4 and bend it over willow 3 and 5. It’s always the same pattern. Lift up the branch and bend it counter clockwise over the ned two branches. Then continue on with the last branch you have just locked in. As soon as your bird feeder is big enough, or the branches get too thick to bend, you can finish the round with one simple step: Just bring the next branch under the fold of the opposite locked branch. If you want to make a double-sided bird feeder, like it’s shown on the left side of the first picture in this blog post, you need to add one thick branch in the middle. The weaving pattern is just the same. The only difference is, that you have one branch in the middle and you weave around it with the others. 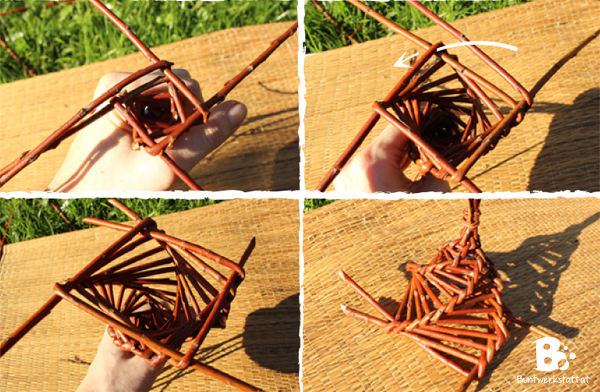 Finish one side first, then turn your project upside down and add five more willow shoots to the other side.